A great article by our friends over at the Cynthiana Democrat talking about the work of artists Ryan Bock and Axel Cajas. The two New York City based artists are in Harrison County as part of the PLACE+SPACE artist residence program at Boyd’s Station during the month of April. This amazing work being created in Boyd will be on exhibit in New York City at the Ki Smith Gallery in October 2019 showing the work made directly from local Harrison County furniture pieces donated by Clifford Craig Heritage Farm. You can be part of this amazing project as well! If you have any older wooden furniture such as chairs or bed frames that you would consider donating to Ryan and Axel for their work, they would love to have additional pieces of furniture from Harrison County to incorporate into this collection. You can reach out to Ryan Bock directly at 914-483-9502 letting him know what you might have to donate to this project. Don’t hesitate to reach out and let them know what you might have that will make this collection of work special. CONTACT RYAN BOCK at 914-483-9502! Boyd's Station is kicking off the PLACE+SPACE residence program welcoming New York City artists Ryan Bock and Axel Cajas arriving in Harrison County and Boyd's Station. Both Ryan and Axel will be working out of the Boyd’s Station Shop Studio Space all of April creating work from found local items and materials. The Clifford Craig Heritage Farm is supporting this first official Boyd's Station PLACE+SPACE residency by opening up a 100-plus year-old home on the property and welcoming the two artists to choose stored and forgotten furniture to be used in their created work while in Boyd as well as other welcoming the artists to explore and find other elements from the Boyd farm and the woods on the farm's property. Boyd's Station and the Ki Smith Gallery are partnering to support these artists. Ryan's work created in Harrison County will be exhibited at the Ki Smith Gallery in New York City in October 2019. The Ki Smith Gallery benefit exhibit and auction in New York City benefitting Boyd’s Station with a nice Newsweek mention. Captured by some of today’s most acclaimed photojournalists, this impressive collection of photographs depicts some of the most famous moments in recent history. These iconic images have circulated the globe in internationally-respected publications, but are rarely available to the public as authenticated, museum quality prints. 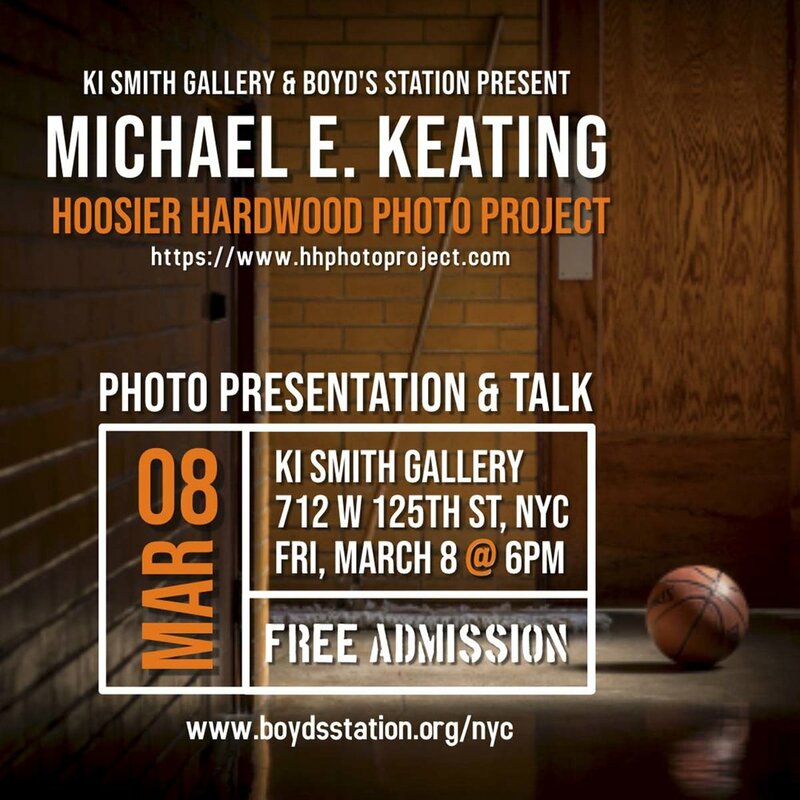 The Ki Smith Gallery Benefit Print Auction for Boyd’s Station opens with a public reception on Thursday, March 7, 2019 at 6PM-10PM showcasing over 70 large prints displayed and made available for this special silent auction benefit. This Ki Smith Gallery benefit will support the Boyd’s Station Project 306.36 and the mentoring and training of tomorrow’s documentary photographers and journalists through the innovative Boyd’s Station Reinke Grants for Visual Storytelling and the Mary Withers Rural Writing Fellowship located in the beautiful Bluegrass Region of Harrison County, Kentucky. ALL PROCEEDS from each print auctioned during this event will FULLY BENEFIT the visual documentary programs sponsored by the arts and journalism nonprofit Boyd’s Station. These beautiful prints have been printed courtesy of Madison Photo Works in Covington, Kentucky exclusively for this benefit auction. All horizontal prints are Digital C-Prints printed on 24” x 20” Kodak Endura photographic paper with 2” white borders on top and sides. All vertical prints are Digital C-Prints printed on 24”x 16” Kodak Endura photographic paper with 2” white borders on top and sides. Each print is signed by the photographer on front (recto) at bottom right of each image with archival black signing pen.